The "Popular Aeromedon" is a anthology of satirical stories parodying French serials & pulp heroes, such as Fantômas, Judex, etc. Bombax is the sole recurring character, but the series also feature Mirandrax, Plombax and Justiflex. 11. 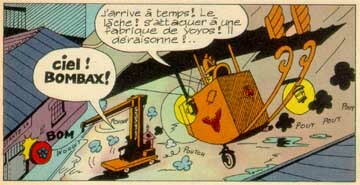 Samson (6 p.) (Pilote No. 413, 1967). 12. 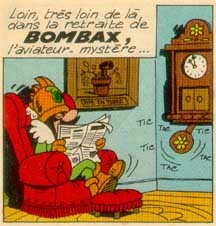 Le Retour de Bombax (The Return of Bombax) (8 p.) (Pilote No. 417, 1967). 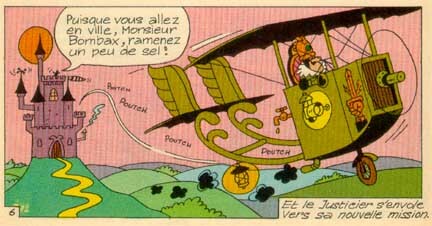 The Popular Aeromedon stories were originally serialized in Pilote from 1966 to 1969 but were never collected in the graphic novel format. 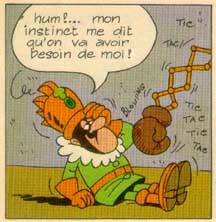 After working as a cartoonist for various daily papers, Fred was one of the founders of the humor magazine Hara-Kiri, for which he created the character of Manu-Manu, and Le Petit Cirque (The Little Circus). 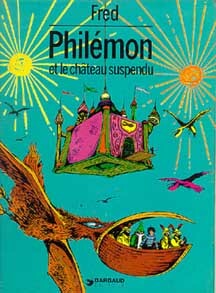 He then joined the editorial team of Pilote in 1965, and created the character of Philémon. For artist Alexis, Fred wrote the humorous adventures of two incompetent time-travelers, Time Is Money. He also wrote Pan et la Syrinx for Mic Delinx, and 4x8=32 for De Groot. In 1979, he created the character of Cythère, a Sorceress's Apprentice, for Pif. More recently, Fred has embarked on a series of surreal moralistic fables, such as L'Histoire du Corbac aux Baskets (The Tale of the Crow Who Wore Sneakers) (1993), etc. 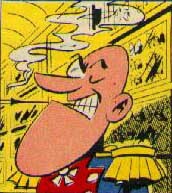 Hubuc (Roger Copuse) (1927-1970) was a Belgian writer-cartoonist who began writing & drawing "mini-récits" for Spirou in 1961. Working with writer Devos, he created the character of Victor Sébastopol. 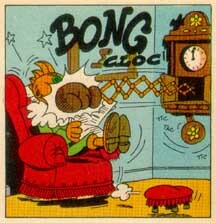 His other series include Tulipe et Minibus and Pancho Bomba drawn by Mike in 1967-68, Chlorophyle & Minimum drawn by Pierre Guilmard, and Wilbur & Mimosa. Aeromedon Populaire © 2002 Fred/Hubuc. All rights reserved.